M&R’s i-Image S™ features the same software, printhead, output quality, and image area as the groundbreaking i-Image ST-36-1, but with a smaller footprint, exceptional pricing, and the ability to image up to 100 screens per shift, it’s the ideal choice for small-to-medium size print shops. i-Image S quickly generates opaque images up to 51 x 66 cm (20” x 26”) on screen frames up to 66 x 91 cm (26” x 36”). And it’s designed to fit through an 81 cm (32") doorway. 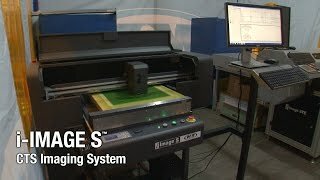 i-Image S includes computer, monitor, and proprietary software that give operators complete control of print parameters, producing high-quality screen images at production-level speed. 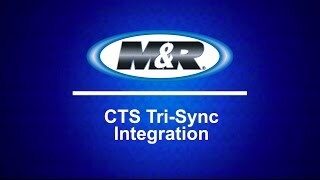 In order to ensure proper screen placement, M&R designed the Tri-Sync™ System. The system’s PRINT button illuminates when the contact indicators determine that the screen has been locked in place. That helps ensure that every CTS-generated screen is correctly pre-registered for M&R’s Tri-Loc registration system. In fact, the Tri-Sync System prevents images from being printed if the screen frame has not been properly loaded (this feature can be turned off). And every i-Image model also includes a Tri-Sync pallet. The pallet’s contact indicator lights up when the screen is properly positioned on the press, giving users the same confidence when registering screens on the press that they have when loading screens onto an i-Image unit. M&R’s Tri-Sync System virtually eliminates operator screen-loading errors on the i-Image or registration errors on the press. i-Image S also uses specially-formulated water-based UV-blocking ink and advanced high-resolution computer-to-screen inkjet printer technology to quickly generate opaque images on emulsion-coated screens. CTS images are superior to traditional film positives, delivering greater detail and smoother halftone transitions. i-Image Series systems eliminate the need for costly film positives, as well as the space and labor required to store and retrieve them. Because the image information is digital, it’s easy to store and quick to retrieve. M&R’s i-Image Series is the most popular and versatile line of computer-to-screen (CTS) imaging and imaging/exposure systems in the industry. The i-Image Series includes the flagship i-Image STE I CTS imaging/exposure system, the i-Image S and i-Image ST imaging-only systems, the oversize i-Image X imaging-only system, and the i-Image XE CTS imaging/exposure system. In short, there’s an i-Image system to suit virtually every requirement. M&R’s i-Image Series imaging systems and all-in-one computer-to-screen (CTS) imaging and UV LED exposure systems will revolutionize your screen room. Once you’ve experienced M&R’s i-Image Series, you won’t be satisfied with anything less. Tri-Loc for CTS (Computer-to-Screen) Imaging SystemsM&R’s Tri-Sync System ensures that every CTS-generated screen is automatically pre-registered for M&R’s Tri-Loc registration system. And the Tri-Sync pallet makes on-press registration blazingly fast. In fact, owners report imaging and exposing screens in as little as 40 seconds—and having them washed out and registered on the press in less than 8 minutes! Users simply mount the Tri-Sync pallet to the press and move it to each printhead, pulling the screen frames into contact with the three registration points. The pallet’s contact indicator lights up when the screen is properly positioned on the press. It’s amazingly fast, easy, and accurate.